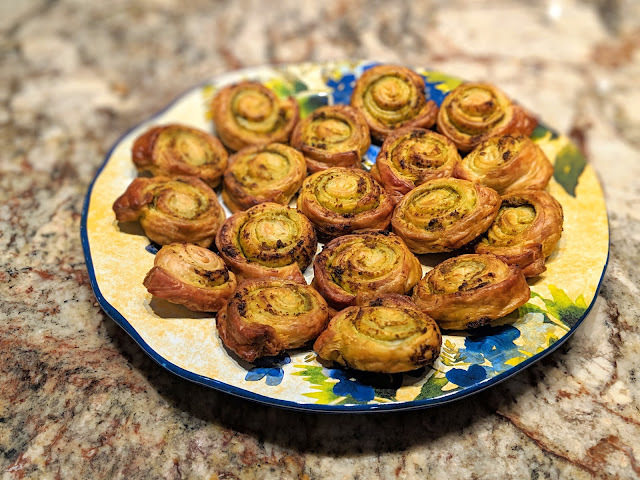 If you need a fresh hot home-made snack for those last minute guests, neighborhood get-together or playdates, look no further than these puff pastry rolls with pesto. They are super tasty and every single time I whipped up a plate, not a single one was left behind! Trader Joe's carries these amazing frozen puff pasty rolls. Each packet contains 2 sheets for $3.99. One sheet makes 18 puff pasty rolls (shown in the picture below) which is plenty to snack on for 4 people (or 2 very hungry folks!). Our nearby store does not carry puff pasty the whole year but only in the fall during holidays - so I always make it a point to stock up a few when I see them in the frozen aisle. Other than frozen puff pasty sheets, the only other thing this recipe needs is pesto. Store bought is just fine but home-made is better if you have some at hand! Other than that "recipe" is not really a recipe but an assembly and prep. Thaw one sheet of frozen puff pastry roll in the fridge overnight or on the counter for 30-mins. Pre-heat oven to 400F. Unroll the puff pastry on a large cutting board (to contain any mess or spills) and then spread a thin layer of pesto evenly all over leaving a little border on each side aside to avoid overfills. If you can't fully unroll the sheet, it means you need some more time thawing. Give it another 10mins and try it again. Once the pesto is evenly spread, roll the sheet back like it was. Using using fingers try to seal the final edge. Then using a sharp knife, cut the roll into small disks - you will get about 18 disks per sheet. Puff pastry will puff up while baking, so smaller disks are just fine. Line the baking sheet with parchment paper and add the pastry disks leaving space between each to puff. Bake for 10-12mins until the outside is golden brown and inside is cooked through. 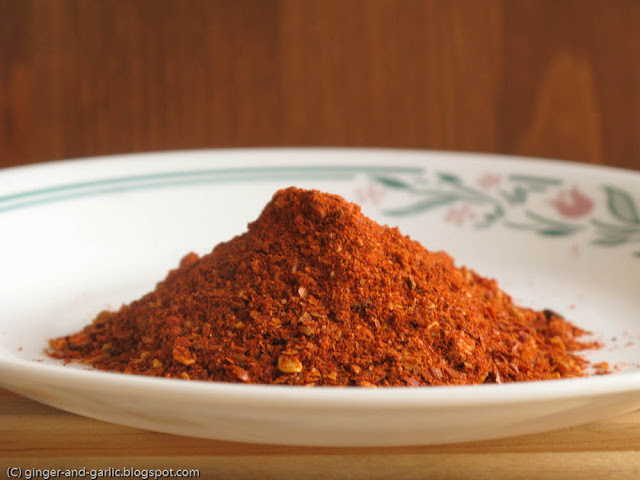 Remove from oven and serve hot! Enjoy! When life gives you lemons.... and I mean, a tree loaded with high quality juicy and orangy Meyer lemons.... the kind which sell for $1 each at farmer's markets... you got to be more creative than making lemonades! We use these Meyer lemons in everyday cooking, we freeze the juice in as many ice-boxes as we can, gift them to neighbors and still be leftover with a large bunch to use. 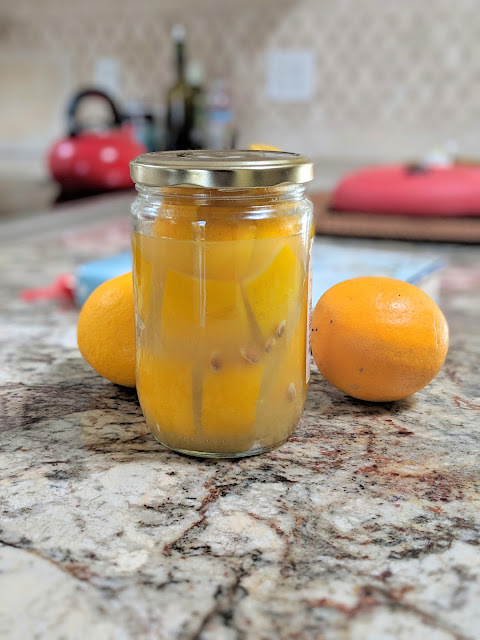 We don't enjoy lemon curd as much and while we devour lemon bars, it seems more butter and sugar than lemons - and predictably guilt ensues :) So this year I decided to try preserving some lemons and wow, am I glad we tried that! Preserving is very simple. All it takes is 15-20mins of prep time and then a few seconds of work each for next 5-6 days and that's that! You put the container in fridge and enjoy homemade preserved lemons for a few months to come! My favorite way to use preserved lemons is to rinse them (to get rid of excess salt) and chop them fine and add as flavoring to any number of tagines or pasta salads, couscous with preserved lemons, olive oil and mint is exceptional, add on top of roasted fish or chicken or just toss on salads for an extra salty slightly tart crunch. Preserving is easy, even for novice jam-makers like me. All you need is lemons (preferably organic), salt and a fully clean and dry canning glass jar. I followed this easy step by step tutorial with photos. Added a couple of whole peppercorns, bay leaf and a few cloves as seasonings and the process took just over 15 minutes. It is important to ensure the lemons are covered in their juices before you can them. If needed, please add more lemon juice on top. Add more salt on top, and that's it, close the jar tight and leave it on counter top for 5-6 days, lightly shaking every day so salt and juice redistributes evenly. I transferred my jar to fridge after the 5th day and we have been enjoying preserved lemons since then. Can you feel the spring in the air? Just as the weather is warming up and days are getting longer, our neighborhood is filled with spring blossoms and our evening walks are just that much more pleasurable. 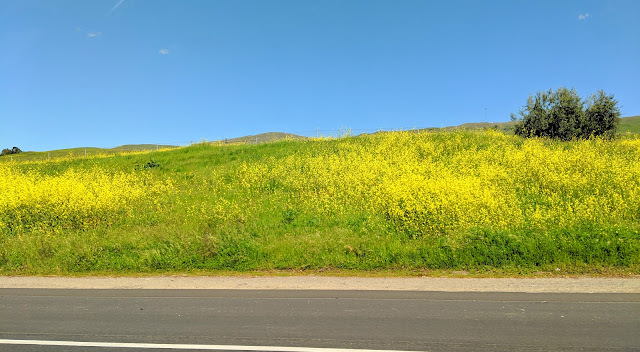 Due to the heavy rain this year, wild flowers are popping everywhere in California and they are so beautiful! 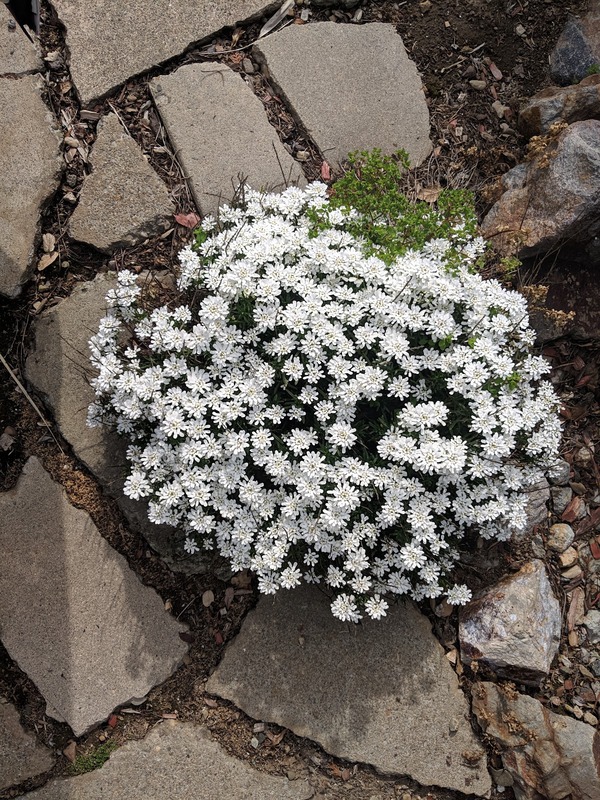 We had one in our own front yard - it looks like white painted jewels and it popping up in between the landscaping of our front yard. We also have a new visitor in our front yard this spring. It's a little bunny who visits every morning right around when kids are about to start for school. 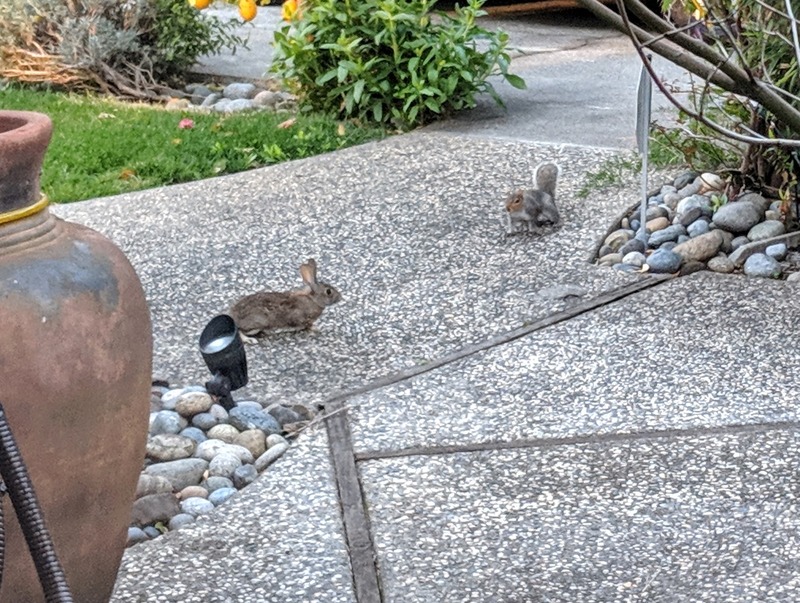 The bunny spotting has been our favorite morning ritual for few weeks. Here is he with a friendly squirrel who is trying to figure out just who this new one is?! Enjoy the scenes of spring! They say every recipe has a story to tell. The older the recipe, the better is that story as generations of home cooks give a part of their times and lives to that story; making the story more and more richer, along with the recipe. This is one such recipe. It's a well loved recipe native to the vast farmlands of central India - close to my homeland. Farmer's life is a hard life in that region subjected to the many whims of weather and landlords. This recipe originated in one such farmland out of necessity. As the story goes, a poor farmer's wife was looking to put together a lunch for her family working in the unusually strong heat of the mid-day farmland. The crop that year had been ruined and all she had to go with were onions - green onions. She was driven by the necessities but was very creative, so she picked up few large bunches of green onions, separated the whites from greens and chopped both very very fine. 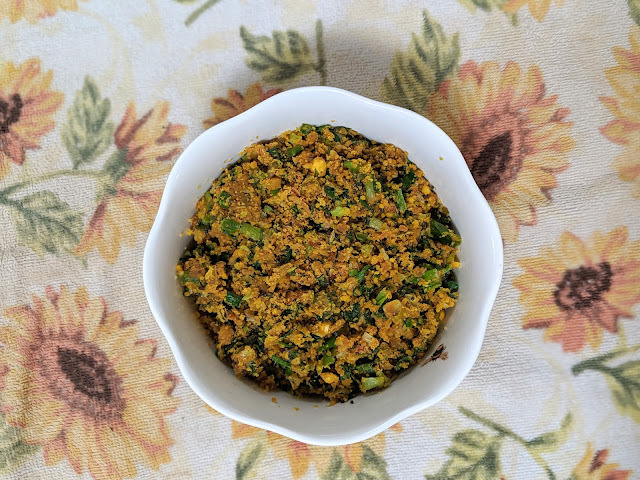 Then she made a simple saute with toasted gram flour (besan) and seasoned with cumin powder - and she called this a zunka, simple preparation of toasted gram flour with seasonal vegetable at hand. In her basket which she delicately balanced over her head, was this zunka, a handful of freshly made bread and a pickle. But the zunka was so tasty and creative, her family and even other farmer's working nearby devoured it to the last bit and so hence forth zunka and bhakar became the farmer's rich meal, a farmland staple - and took an unmistakable place in the vast array of Maharashtrian cuisine. Fortunately I wasn't under any such duress but I also came up with only two bunches of green onions from farmer's market yesterday :). This has been an unseasonal wet spring delaying the onset of usual vegetables of this time and leaving us with mere basics. So I did just what the farmer's wife had done - I made a simple zunka which was well loved by everyone. The recipe is super simple. Toast 1C gram flour or besan taking care to not burn and set aside. Then add oil to a preferably non-stick pot. When hot, temper with 1/2tsp mustard seeds and chopped green chili. Add finely chopped onion whites and let them caramelize stirring often. Then add 4 cloves of chopped garlic, saute until fragrant. Follow up with the finely chopped onion greens and the toasted gram flour. Mix well. Add salt 1/2tsp cumin powder and mix well. If too dry, sprinkle a bit of water. The consistency should be crumbly. Remove from heat - serve hot with roti, a slice of raw onion and a pickle or peanut-garlic relish. Enjoy! Just as the weather starts warming up, our local California farmer's market welcomes the onset of spring with baskets and baskets full of broccolini. For a long time I thought broccolini was the young broccoli, just as spring onions are the young onions. Turns out not so per our farmer's market vendor lady who is as knowledgeable about her vegetables as wikipedia, truly, and on top will be more than happy to give you tried and tasted recipes from her kitchen - just in case you need that extra push trying out something unfamiliar. And she is quite right of-course; broccolini is similar to broccoli but with smaller florets and very thin and long stocks. Wiki pronounces it as a hybrid. It also has a slightly stronger punch than regular broccoli so you may find it slightly bitter if you cook it without steaming first. Steaming takes the edge off of it and it's just delightful steamed and sauteed and finished with a good quality finishing salt. 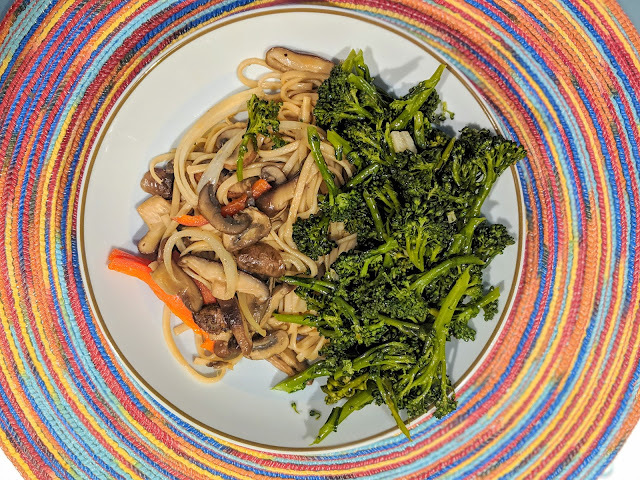 My favorite way to enjoy broccolini is as a simple side for stir-fried noodles with lots of vegetables. You can use any noodles at hand and even spaghetti works just fine if that's what you have. To prepare broccolini, I use my instant pot for steaming. Add 1C water to the instant pot in saute mode. Meanwhile prep broccolini - there is not much to prep, but I usually look at the ends and snip off any tough ends and wash broccolini well in water. Add the instant pot steamer insert and add broccolini to instant pot, close lid, change to steam mode with 0 minutes of steam time. While the broccolini is cooking, you can chop the vegetables for the stir-fry and get that going. With 0 minutes of cooking time, instant pot will stop right when steam builds up - which is just enough steaming for these tender vegetables. Quick pressure release, and drain them well in a colander. Heat olive oil in a saute pan, add 2 chopped garlic cloves and a pinch of crushed ref peppers and saute in low heat so the oil is infused with garlic flavor but taking care to not burn the garlic. Add steamed broccolini, use the best finishing salt at hand (my go-to is a Himalayan pink salt), mix well and serve immediately! 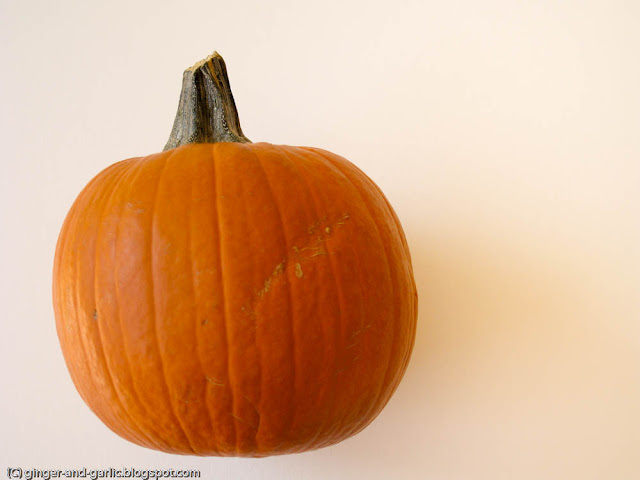 One of the beauty of seasonal eating is that you associate a season with the seasonal bounties that it provides. And I bet once you try these fresh broccolini at the best of their season, there will be one more reason for you to look forward to spring - always! It was one of those perfect Saturday mornings when you wake up to the pounding of an unceasing rain on the window panes and you silently say a prayer for the little pleasures of life: for this day being a weekend - to be able to sleep in late and to avoid a rainy messy bay area commute that otherwise would have been the morning. Instead I woke up to a steamy hot cup of coffee and spent the next hour enjoying an elaborate breakfast flipping through the news and recipes on nytimes - my favorite weekend boot me ups. As one thing leads to other, daughter and I decided that this morning called for baking! I truly find baking therapeutic - there is something about the act of mixing the dough and then waiting for the baked goodies to be ready while your entire kitchen wafts with an aroma that is so reminiscent of your favorite bakery or your coffee shop - just acts as a very positive, rejuvenating force for me, signalling the start of the weekend, the start of winding down and of that quality family time. Anyhow, we had a half used package of slivered almonds in the fridge which needed using up, and so I chose this almond biscotti. The recipe from Joy Of Baking is pretty much fool proof even for new or casual bakers. And best of all the batch turns out just fine by hand mixing and does not need a stand mixer (which I have resisted owning so far). I like my biscotti a little chewy and not super crunchy. So I can dunk them in my coffee but I can enjoy them just by themselves as well. To make them chewy I stay with the lower end of the cooking times - 11min when it says 10-15mins for example. It's a relatively long process but largely hands free. To make them extra special, you can also make chocolate dipped biscotti by dipping them into melted chocolate at the end. I am hoping this batch gets us through he next few rainy weeks on the horizon until spring gets here! 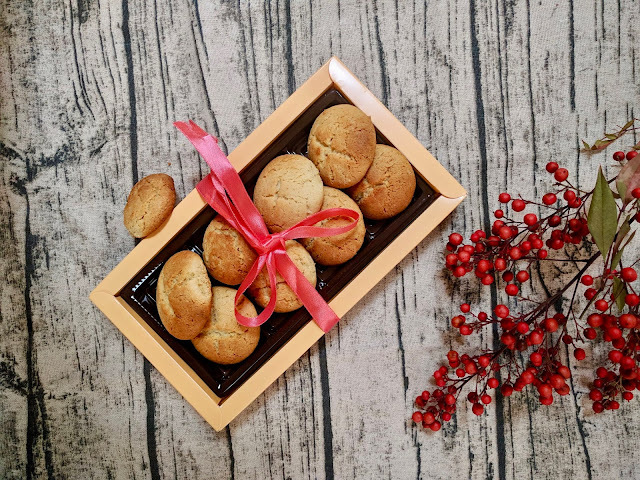 Enjoy the biscotti with your favorite hot cup of coffee or tea! This polenta dish is my new go-to weeknight favorite. It is an ultimate comfort meal but also looks and tastes quite sophisticated to deserve a place at a sit-down dinner! 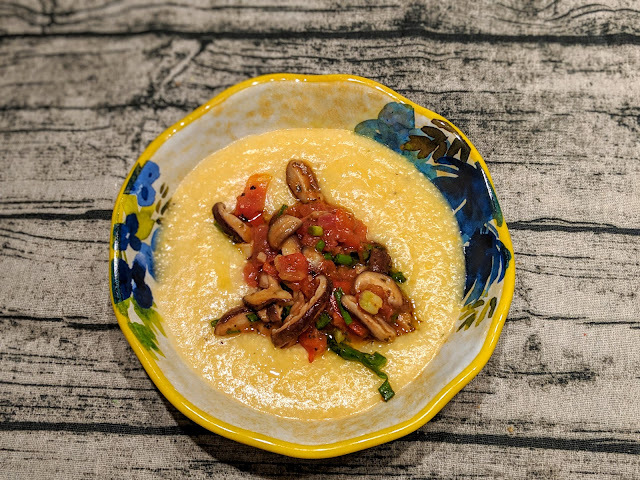 Polenta serves as a departure from the usual noodles and pastas that attend the weeknight last minute meals. Sometimes varierty is all your need to keep weeknight dinner rotations interesting! I use Bob's Red Mill's polenta corn grits. The regular corn meal might work as well, but this one is specially made for polenta and it cooks up really quickly. I use the ratio 1:5 for a ceamy polenta - ie, add 1C corn grits to 5C of hot water gradually stirring constantly. Then drizzle in some olive oil, add salt to taste and let it cook away partially covered for about 20-25 minutes stirring every few mins. I use a large pot to cook polenta because it sputters a lot and can sting your hands while stirring, so be careful! While the polenta is cooking, I start the sauce. While any mushrooms will work, I must say I am absolutely in love with the fresh shiitake mushrooms our farmer's market carries, particularly in the rainy season, they are just a delight to cook with and devour! I highly recommend you to try buying freshly picked Shiitake if you can, but if not any regular supermarket mushrooms will do. Heat olive oil in a pan, add 2 cloves of crushed garlic, pinch of chilli flakes and saute for a minute or two until oil is fragrant with garlic and chillis. Then add handful of chopped mushrooms, season with salt & pepper and cook for a few minutes until the mushrooms have released all their juices. Then add 2 large tomatoes chopped, season with fresh or dried basil and cook for 5 more minutes until tomatoes have softened. If tomatoes aren't very juicy, please feel free to add 1/4C water along-with tomatoes to create "sauce". To serve: add creamy polenta to a small pan or bowl. Then laddle some sauce and drizzle with a good quality truffle oil (or just regular olive oil if no truffle oil at hand) and finish with some finely chopped basil. Eat while warm and enjoy! 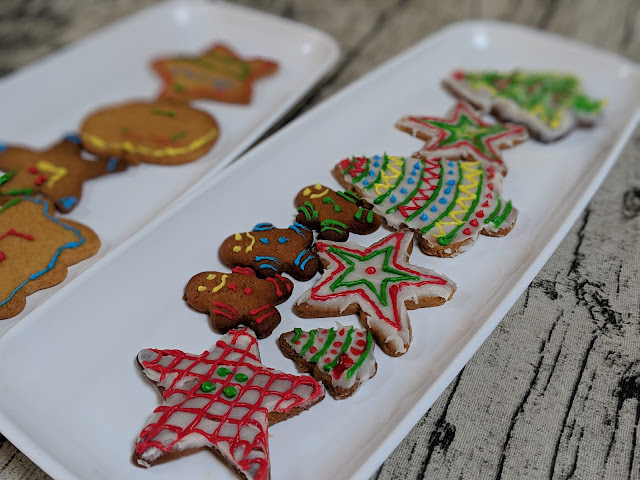 Happy Holidays - Holiday Baking! It is that time of the year again - when homes everywhere are adorning beautiful Christmas trees dazzling with twinkling lights, cherishing family memories over the years as pretty ornaments. Love and laughter of friends and family is everywhere. And the tiny kitchens and ovens become stars of the homes churning out wonderful dishes and wafting beautiful baking aromas that are so reminiscent of the holidays! 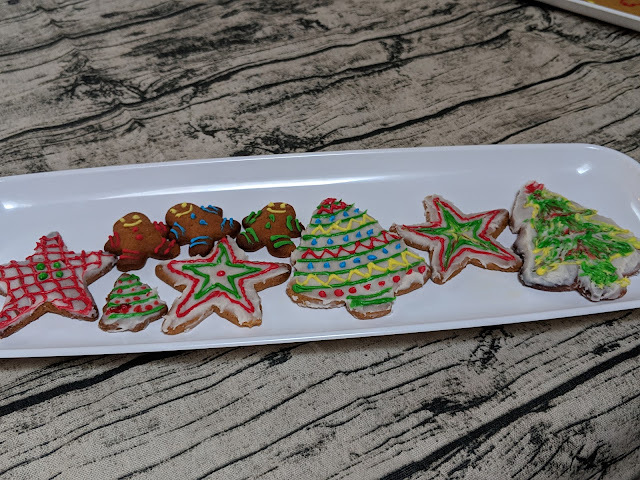 When my daughter turned two, we started an annual Christmas Eve cookie baking tradition - we don't have many traditions in our house, but we have that one and we have been on it year after year. As a toddler, all she could do was lick the dough and be the eager taster - but now, she helps select recipes, makes dough and takes charge of decorating half the batch. Life gets soo busy and stressful year around that I have really come to cherish these small pleasures and tiny moments of baking together on Christmas Eve! We rarely bake cookies otherwise in the whole year, so it's something we both eager look forward to just as December rolls in. Simple sugar cookies which we decorated with icing. 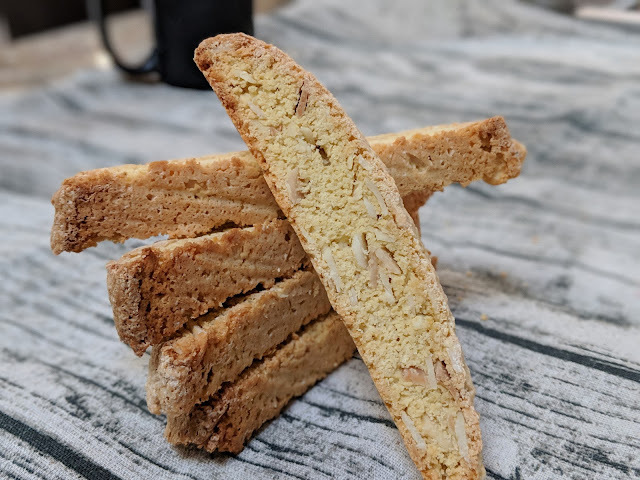 For grown-ups of the house, a fresh batch of almond biscotti to dip into afternoon tea or coffee. Of the three biscotti's were my favorite. I skipped almond liquor but instead added almond extract. It came out wonderful. At baking times of 35-10-15 mins, the biscotti were not super hard - a pleasure to dunk in but also could it on it's own too. I'll definitely be making these again and again! 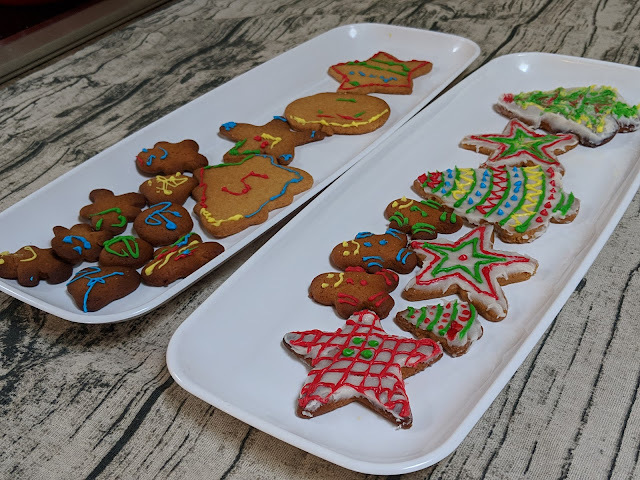 I made only one change to the gingerbread cookies recipe. I really avoid to buy large portion of an ingredient, when only a little bit is used in a year - so in the spirit of limiting waste, I substituted molasses with dark honey we bought from farmer's market the day before. It turned out just fine. This year we also experimented a lot with icing decorations - specially using unique patterns by mixing colors using toothpicks. A cookie then becomes only but an empty canvas to express yourself with colors - as my daughter called it, it's just like painting! Merry Christmas and Happy Holidays to all my friends and readers! Do you make granola at home? If not, I'll highly recommend giving it a try. It's super simple - no recipe needed and highly customizable to your taste! Just mix the dry and wet ingredients together and bake at low temp while stirring every 10 minutes. 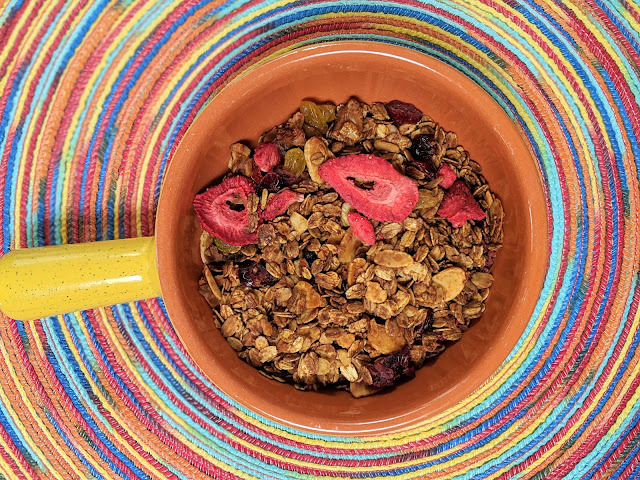 Organic pre-made granola can get pricey and besides you can make endless variations to suit your taste buds when you make it at home. As an added benefit, home is filled with cinnamon and nutmeg baking aromas for hours afterwards - just as I like it. There is no recipe as such but these are some very general guidelines I follow: 3C rolled oats + 1C nuts & seeds to 3/4C wet (sweeteners + oil) to 1C dried fruits (raisins, cranberries, dried cherries, dried coconut flakes) and finally the flavorings - my favorite combo is cinnamon, ginger and nutmeg powder or just substitute pie spice if you have at hand. Granola bakes at a low temp - like 300F for a long time (40 minutes) - all you need to do is keep stirring every 10-15 minutes. Mix all dry ingredients except dry fruits and coconut flakes. Add wet ingredients to dry ingredients and mix well to quote thoroughly. Line a half sheet pan with parchment paper. Spread the granola mixture in a thin layer on sheet pan. Bake for 40 minutes until granola turns golden brown. Spread around with a spoon every 10-15 minutes during baking. Remove from oven. Immediately add dried fruit. Mix well. Let cool. Once cold, store in an airtight container. Serve as a cereal with milk, or on top of yogurt or just munch on their own. This page and all of its contents is copyright of Prajakta Gudadhe. All rights reserved. This is a web catalog of the recipes that I have tried and tasted in my kitchen. While these recipes and instructions have worked well for me, please use all the information and the recipes from Ginger and Garlic at your own risk. 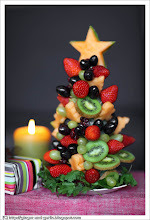 Spread some Holiday Cheers with a nice edible fruit tree! Don't miss a single post - Follow by email! Edible Christmas fruit tree and a wish for a very Happy Holidays! Ethiopian Sambussa -- healthy baked cousins of samosas with phyllo dough!